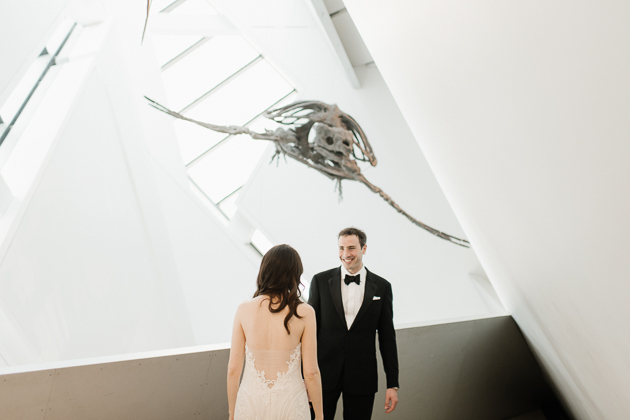 Inside a Magical & Whimsical Royal Ontario Museum WeddingGet your Pinterest boards ready 'cause this wedding is gorgeous! 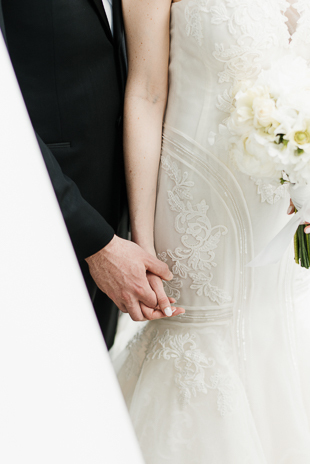 I first got to know Roxy and Daniel during our engagement session. 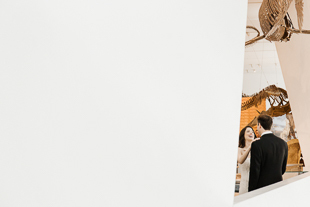 It was the middle of February and we planned for a casual at-home engagement shoot. 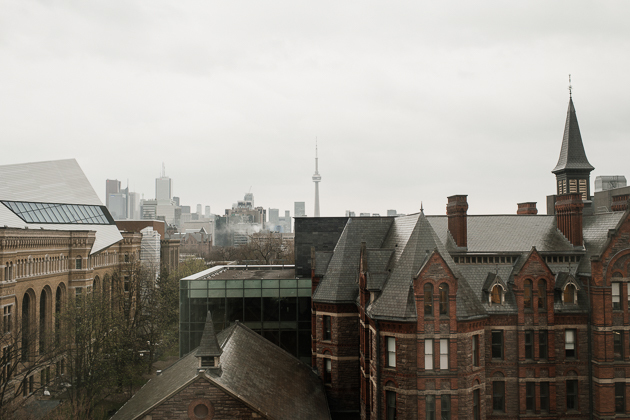 Unexpectedly, it started to snow that morning so we hatched a last minute plan to snap some snowy photos outdoors. These two were so laid back and totally on board with this change. 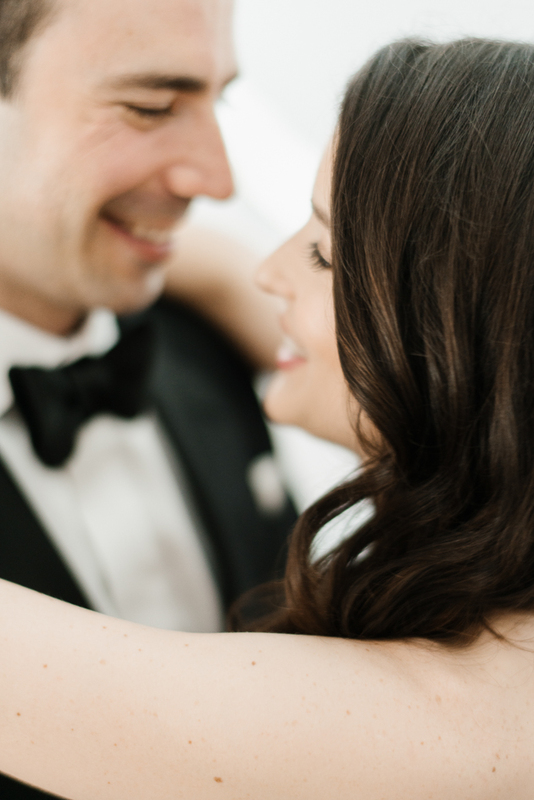 It was then that I realized, much like their engagement session, these two had a love that was so easy and endlessly fun. 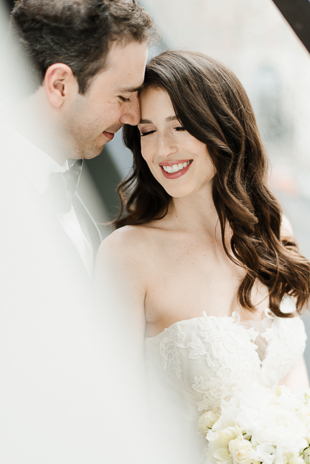 I knew that if we could create evocative photos wearing comfy sweaters in a snowy alleyway, no matter where we were for their wedding photos, it was going to be complete magic. Fast forward many months later, and we are not wearing sweaters in our cosy apartment. Nope, far from it. 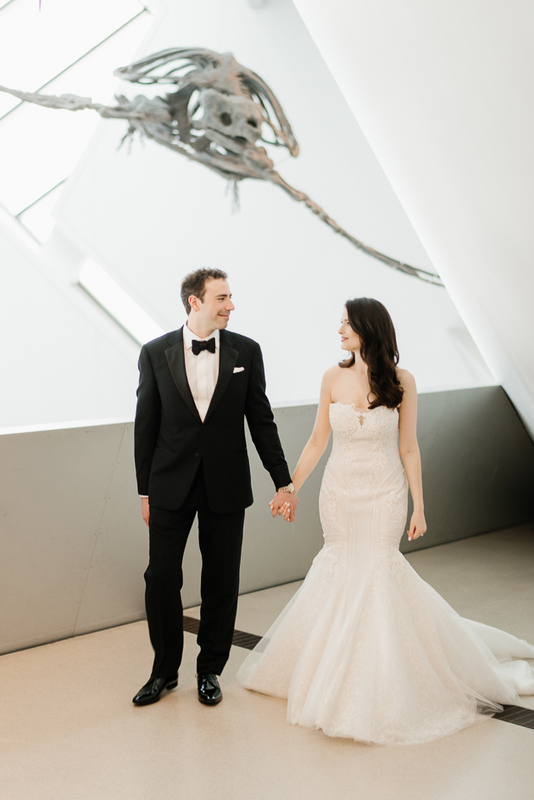 Dressed in a elegant strapless gown and classic tux, Roxy and Daniel are standing in Toronto’s The Royal Ontario Museum getting ready for the first look. 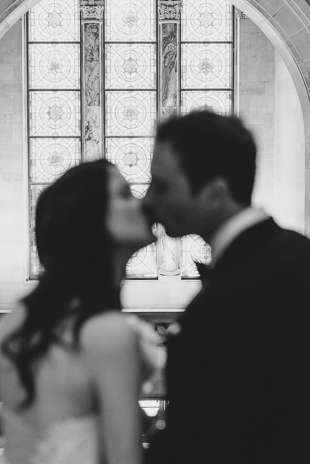 And despite the incredible location, one thing still remains the same, these two are simply and utterly in love. 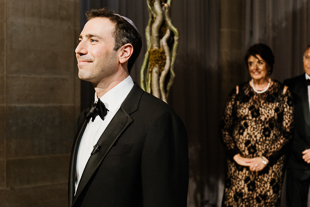 As Daniel is nervously waiting for Roxy to walk up behind him, a take a moment to marvel in the architectural wonder we are standing in. 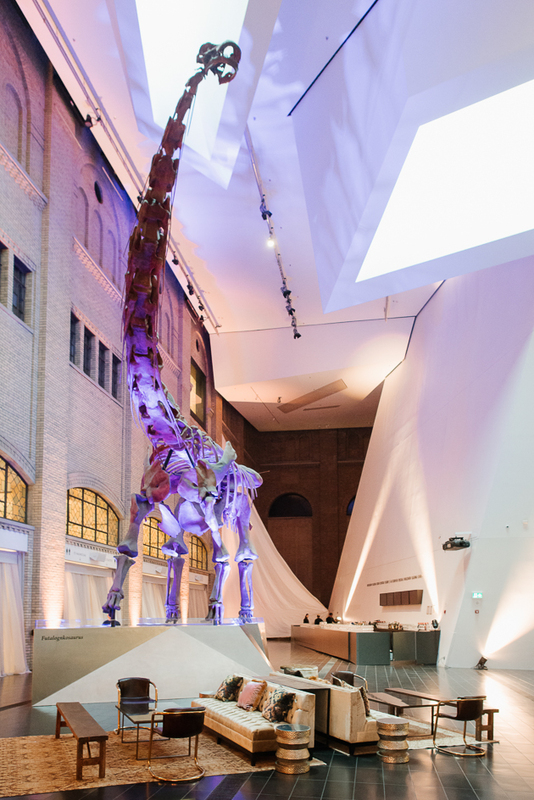 The Royal Ontario Museum is Canada’s largest museum for art, culture and history. 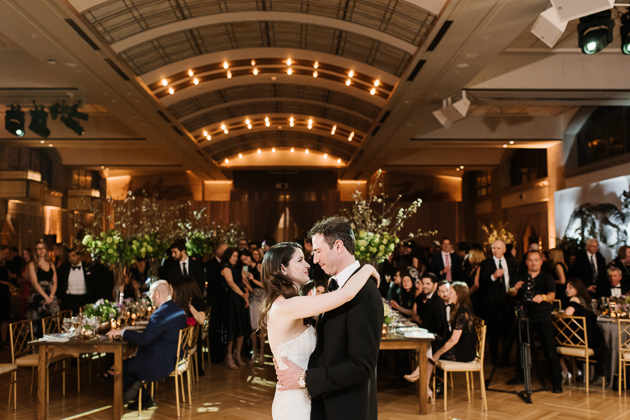 Over a hundred years in operation, the Royal Ontario Museum is one of the most coveted locations in Toronto for a luxurious wedding with worldly taste. 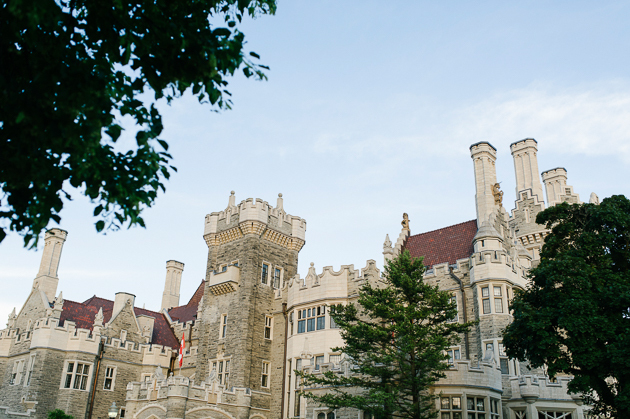 This historic building is designed in the Neo-Byzantine style. 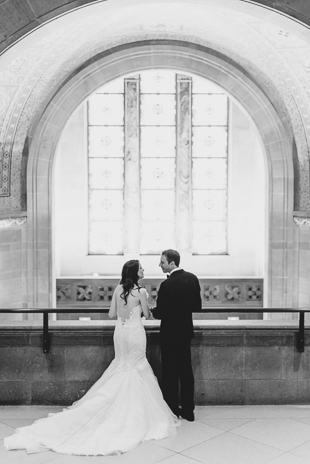 Dripping with archways and ornamental details, this space is a photographer’s dream. There are endless opportunities for incredible photography. 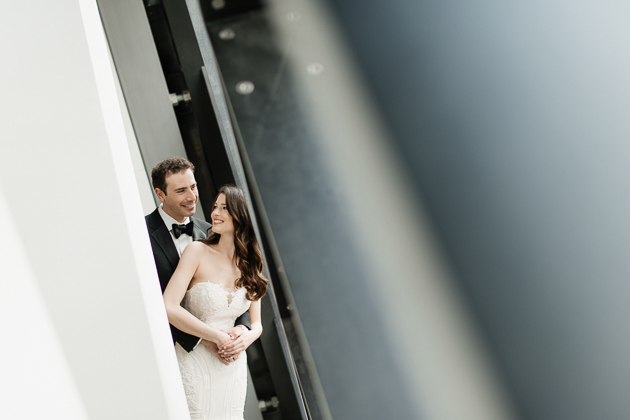 As if the historic wing of The Royal Ontario Museum didn’t have enough places for wedding photography, the newest addition (completed in 2008) allows for some super modern shots. 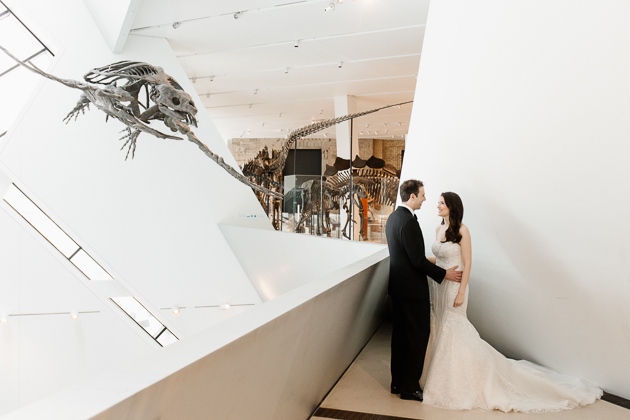 A Royal Ontario Museum wedding means you get the best of both worlds. 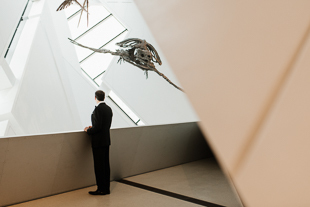 And can we talk about the dinosaurs? 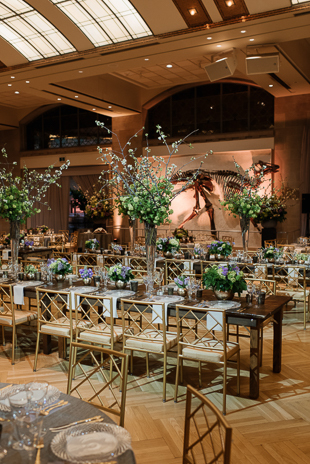 A whole room full of ancient creatures suspended from the ceiling. 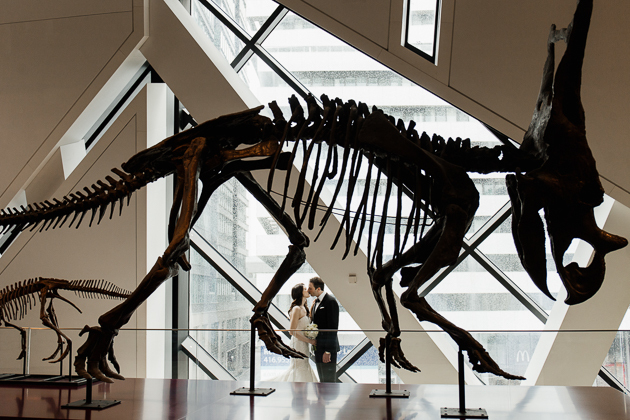 When Roxy, Daniel and I first talked about having a Royal Ontario Museum wedding, I knew we had to do something cool in the dinosaur exhibit. 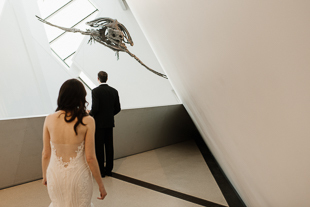 The juxtaposition of dinosaur bones and modern architectures creates a feeling of total epic-ness that heightens the already monumental event of a first look. Finally, Roxy walks up to Daniel and the moment could not be more tender. Smiles lighting up their faces as the giggles echo. 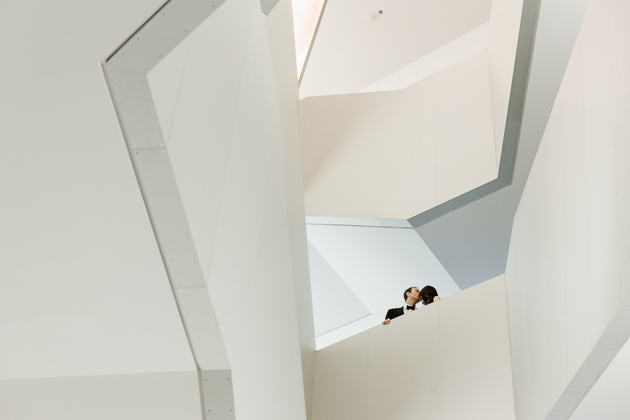 Designed by Daniel Libeskind, The Crystal, is the jagged front entrance designed to link the old heritage building with the new modern design. 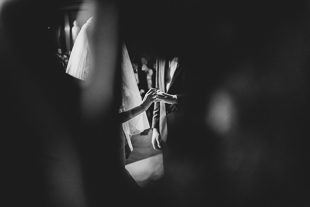 As a wedding photographer, I love using the geometric shapes and angled lines to create some really killer abstract photos. I made sure to take Daniel and Roxy to the inside of The Crystal for some cool, modern portraits. 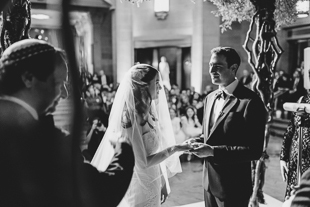 Guests of couple gathered in the rotunda as they waited for the ceremony to start, and boy, were they in for a treat. 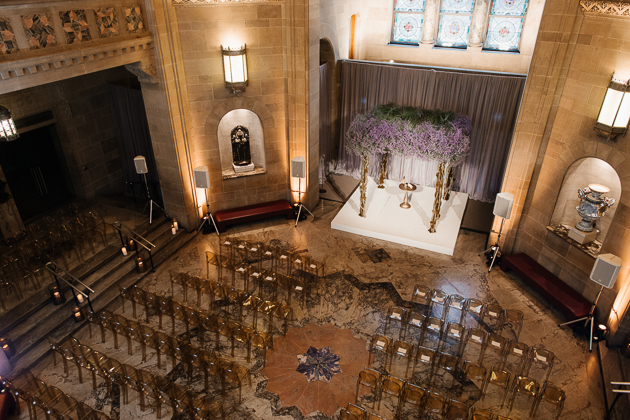 Lined with gold painted glass tiles, the mosaic ceiling of the rotunda knocks your socks off. 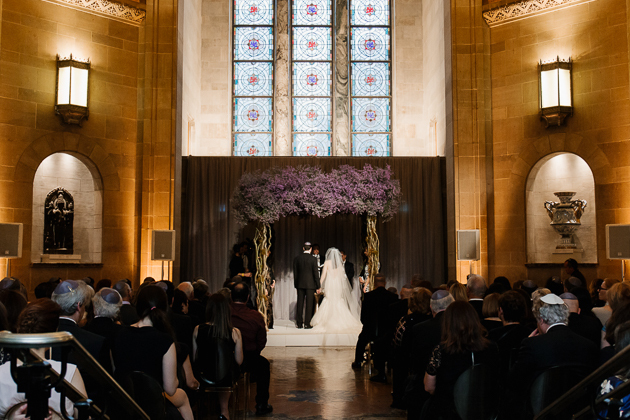 Twisted branches, spiralling towards a cloud of purple flowers, Roxy and Daniel’s chuppah was stunning to photograph. 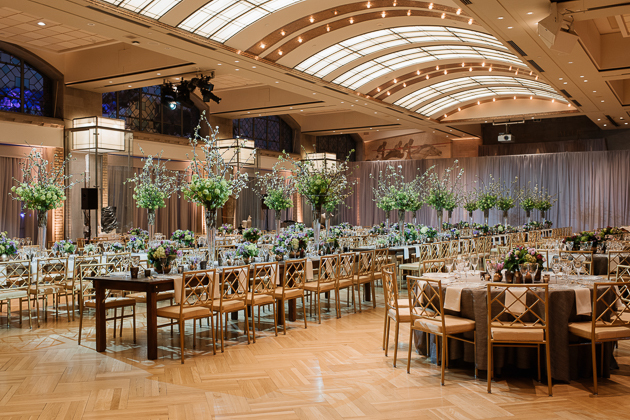 The purple was a striking contrast against the gold backdrop of the building. 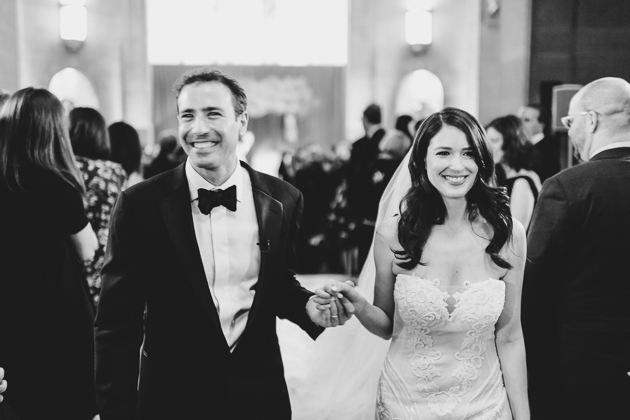 An emotional Roxy walked down the aisle towards her husband-to-be and the ceremony got underway. 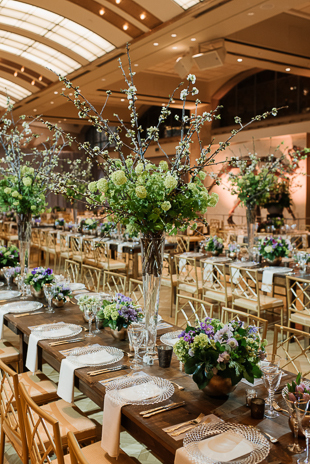 Whimsical, springtime florals and budding branches lined the harvest tables in the reception space. 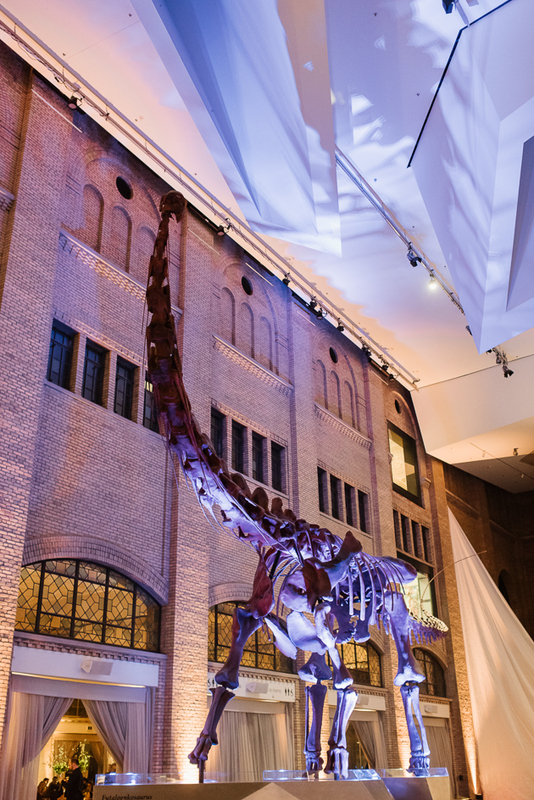 And can you believe it – dinosaurs just “hanging out” behind the podium during the speeches? 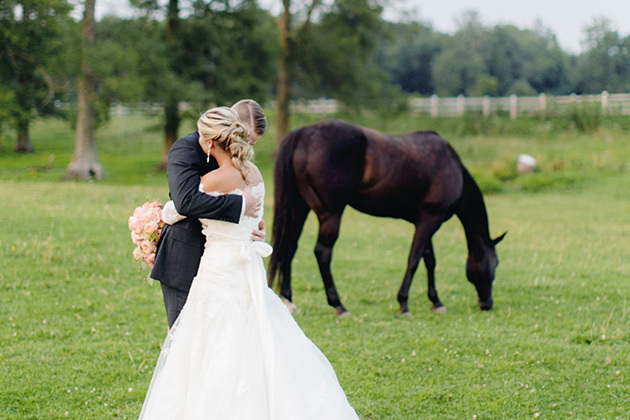 As Roxy and Daniel had their first dance, it all felt like something out of a movie. 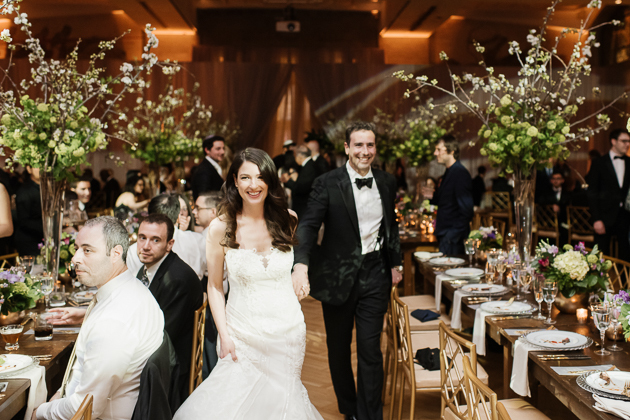 I moved around the room capturing the mix of laughs and tears as guests chatted with each other and listened to heartfelt speeches, the whole time Roxy and Daniel just beaming. 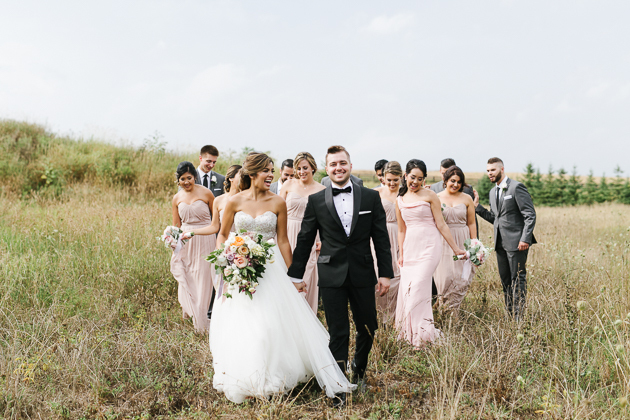 From the carefree engagement session to the deeply moving wedding day, I always feel like the luckiest wedding photographer when I meet couples whose love is so easy and real – no matter the environment. 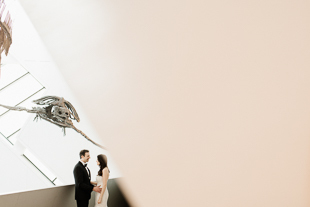 And this magical Royal Ontario Museum wedding is no exception. 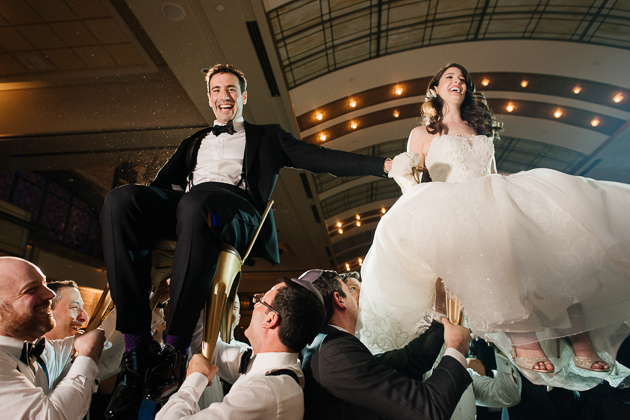 Thank you Roxy and Daniel, it was so much fun sharing in your super special day with you! 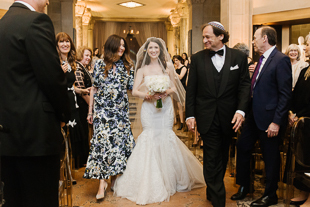 This is a unique wedding style I have ever seen. Photography level is stunning.